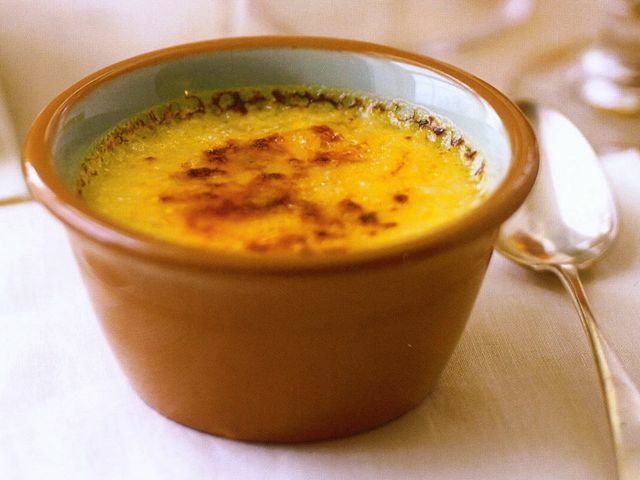 The classic crème brûlée has spawned countless flavor variations, yet this refined version is elegant in its simplicity. A vanilla bean is a must for superb flavor; vanilla extract is not an equal substitute. Pour the cream into a medium saucepan, scrape the seeds from the vanilla bean into the cream, and add the vanilla pod. Place over medium heat until small bubbles form around the edges of the pan. Remove from the heat and let cool to room temperature. Remove the vanilla pod and scrape any remaining seeds into the cream. In a medium bowl, whisk the egg yolks until pale in color. Whisk in the ⅓ cup granulated sugar until dissolved. Gradually whisk in the cream. Stir in the Cognac, if desired. When ready to serve, place the dishes on a baking sheet. Evenly sprinkle 1 tablespoon brown or granulated sugar over each flan-sized custard, or 2 teaspoons sugar over each ramekin-sized custard.